This committee is tasked with increasing and sustaining membership. It seeks to increases membership through recruiting efforts such as visiting law offices, law schools, and bar association fairs. It is also responsible for securing and engaging student liaisons at St. Louis University, Washington University, University of Missouri-Columbia, University of Missouri-Kansas City, and Southern Illinois University-Carbondale. It seeks to sustain members by assisting in the development and implementation of membership benefits such as facilitating networking opportunities, coordinating monthly mentorship luncheons, and promoting members through communication of job opportunities and award nominations. WLA’s website serves as the primary means of communications between the organization and its members, and provides information to the general public. This committee is in charge of maintaining, revising and editing content on the website, coordinating electronic event communications, and maintaining the organization's member and new applicant database. WLA’s public perception, visibility, and influence are important to its ability to fully execute its mission of promoting women in the legal profession and creating positive change around women’s issues in the general community. This committee communicates with local media outlets, works to enhance the organization’s access to the media, promotes the organization and its efforts and events through media coverage, and ultimately strives to shine a light on substantive issues of importance to women and the legal community. WLA awards scholarships to female law students through the Linda J. Murphy memorial scholarship fund, supported by proceeds from the WLA Annual Golf Tournament and individual donations from WLA members and supporters. The committee communicates with administrators and women student leaders at each of the Missouri’s four law schools and Southern Illinois University-Carbondale School of Law, solicits and reviews student applications and recommends recipients to the WLA Board for approval. The promotion of women in the judiciary and other positions of influence and leadership is a key function of WLA. This committee tracks vacancies within the judiciary and other arenas (e.g. bar leadership), informs the board when vacancies arise, and coordinates the application and endorsement process. The committee also collaborates with the Sue Shear Institute for Women in Public Life to promote and support women seeking judicial appointments. This committee organizes the annual legislative luncheon where female state legislators inform members of current legislative issues. The committee selects the theme of the discussion, solicits the participation of the legislators, communicates with the Missouri Bar to obtain CLE accreditation for the event, and plans the logistics of the luncheon. This committee also tracks state legislation of interest to women lawyers and, from time to time, submits summaries of such legislation for publication in the WLA newsletter. This committee is responsible for WLA’s annual holiday party and charity auction, proceeds of which are donated to local charities serving women and children. Committee members solicit and review charity applications and recommend recipients to the Board for approval. Members also organize the event by soliciting auction items from individuals and local businesses, preparing bid sheets and related documents, and planning event logistics for the party – one of the best attended events of the year. WLA offers CLE programs from time to time. The programs are open to all lawyers. Committee members select the topic, recruit speakers, communicate with the Missouri Bar to obtain CLE accreditation, and plan event logistics. This committee is open to past presidents of the organization. In its advisory capacity, the committee provides historical perspective and institutional knowledge to advise the board on policy issues. In its historian capacity, the committee is responsible for organizing and maintaining the organization’s archives. This committee encourages diversity throughout our profession. The committee plans activities and events with other bar associations to share in the missions of each bar association and celebrate our differences and commonalities that enhance the legal profession. This committee develops and facilitates educational, professional and community programs that benefit the local community and the legal profession. The committee is responsible for conducting service projects that promote WLA’s mission in providing opportunities for volunteerism and advocacy on issues affecting women. The committee organizes various community service projects and volunteering activities throughout the year. The committee organizes an annual breakfast with the Association of Legal Administrators (ALA) to benefit the Center for Women in Transition. 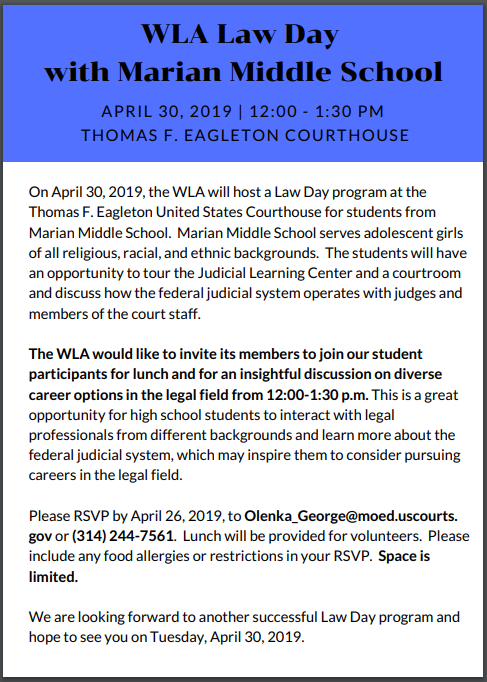 The committee also organizes an annual Law Day program aimed at providing high school students an opportunity to interact with legal professionals from diverse backgrounds and learn more about the federal judicial system.